Samsung has launched Galaxy M20 with 5000mAh Battery which takes on Realme U1 which comes with a 25MP front camera, Dewdrop Notch. 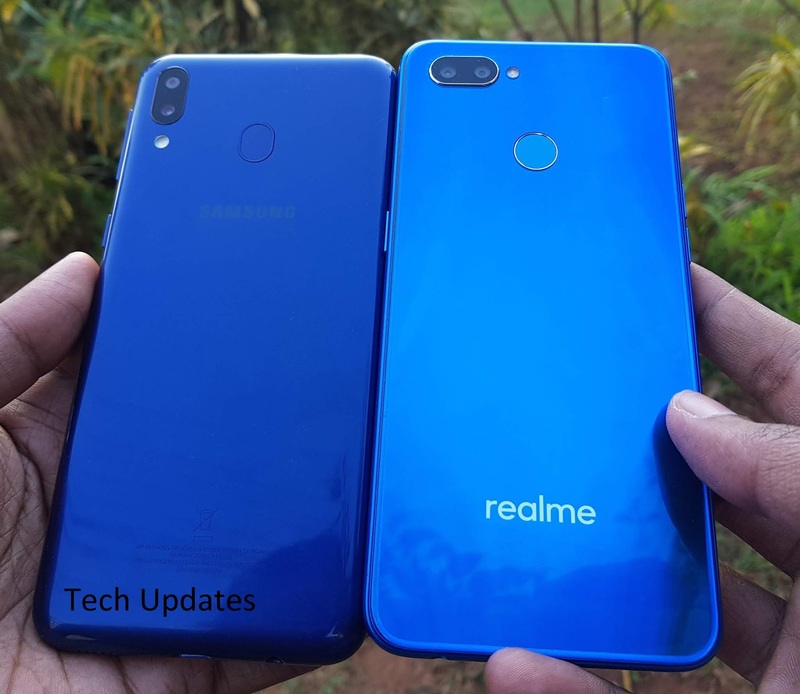 Check out Design, Camera, Performance, Battery Comparison between Galaxy M20 and Realme U1. On Design both phones have a plastic body, On Display Galaxy M20 has a 6.3-inch (2340 x 1080 pixels) Full HD+ TFT display whereas Realme U1 comes with 6.3-inch (2350 x 1080 pixels) 19.5:9 Full HD+ IPS display. Galaxy M20 is powered by Octa-Core Exynos 7904 14nm processor with 3/4GB RAM, 32/64GB Storage compared to Octa Core MediaTek Helio P70 12nm processor with 3/4GB RAM and 32/64GB Storage, Performance on Realme is better than on Galaxy M20. both phones support for Dedicated MicroSD card slot. On Camera, Galaxy M20 has a 13MP rear camera with LED flash, f/1.9 aperture, 5MP ultra-wide angle camera with f/2.2 aperture and 8MP front-facing camera. Realme U1 has a 13MP rear camera with LED flash, f/2.2 aperture, 2MP secondary camera with f/2.4 aperture and 25MP front-facing camera both phones can record 1080p videos do not support EIS, Camera is better on Realme U1. 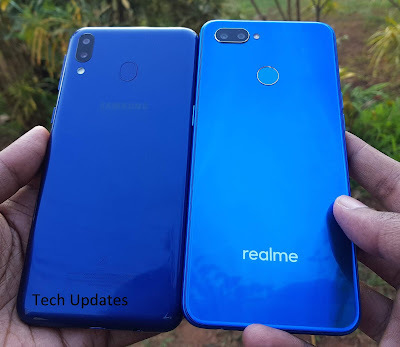 Galaxy M20 has 5000mAh battery whereas Realme U1 comes with 3500mAh Battery. Samsung Galaxy M20 starts at Rs. 10,990 for the 3GB RAM with 32GB storage, 4GB RAM with 64GB storage version costs Rs. 12,990. Realme U1 is priced at Rs 10,999 for 3GB RAM and Rs 13,499 for 4GB RAM. 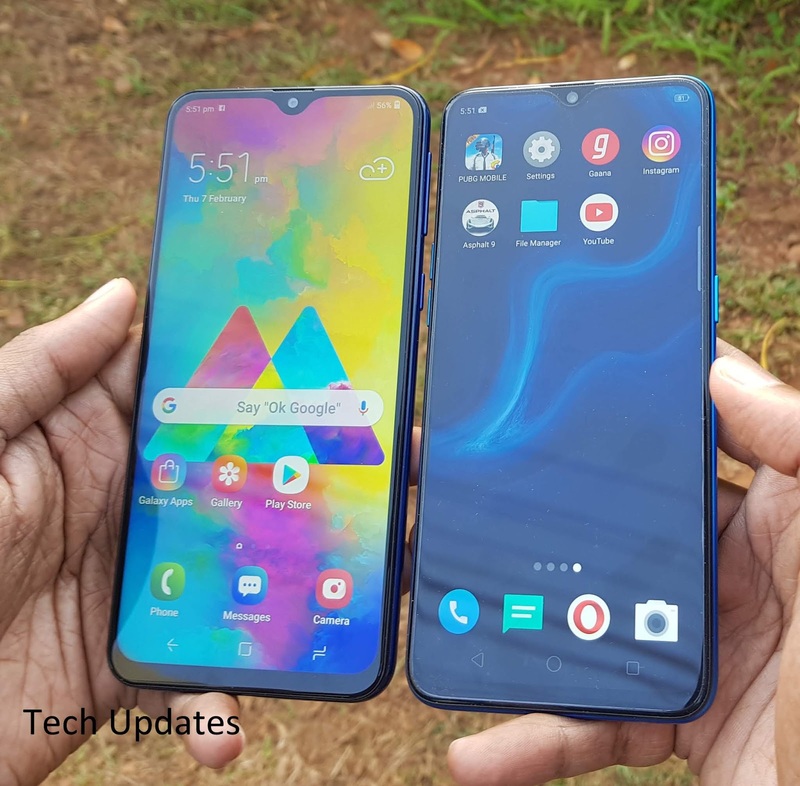 Realme U1 has a better processor, Camera whereas Display, Battery life better on Galaxy M20.